Mark Lester, Bruce Welsh, Ross Hamilton, Simon Lord, Peter Wood Christopher Harper, Christopher Prentice, Christopher Young. In a recent article in the "Weekend Scotsman” the island moors are described as "..the oldest, kindest, sweetest smelling, most beguiling countryside left in the land..if there is a heaven on earth then it is here." While most of us at the end of a weary walk in the drenching rain and yielding peat must have cursed this "heaven" the sentiment does go part of the way to explain why we go to the remotest parts of the Hebrides for fun, and not self punishment. 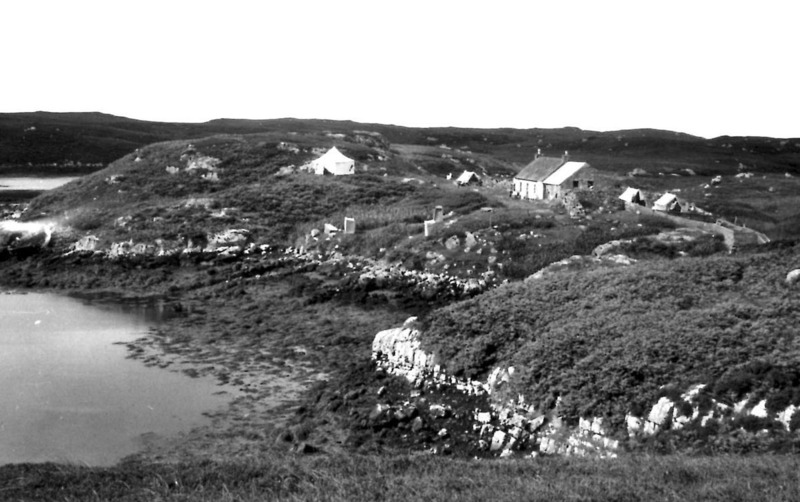 The focus of the expedition to North Uist was a cottage called Eaval, set in the south east corner of the island where the 'most beguiling countryside” expires in a maze of sea lochs and rocky islets. All paths led to its promise of food and shelter. It is therefore to the credit of everyone who took part in the expedition that, despite continual rain and cloud, the cottage was mostly empty during the day, and an exceptional range of explorations, projects, and activities was accomplished. To convey the true atmosphere of the expedition I would have to describe something of the character and activities of each of those people listed at the head of this article. But that is clearly impossible in such a short space. There were achievements, however, of which we may all be proud as a group. There was: The ascent of all the three highest peaks on South Uist, and the highest on North Uist survival of an orienteering course, survival of a wide game, visits to Balranald R.S.P.B. reserve, visit to a working tweed loom at Loch Eport an archaeological dig at Sollas, a fair at Hosta, and canoeing, sailing, walking, climbing, and bivvying in damp weather with undampened enthusiasm. Singing and stories filled the evenings in the' barn' by the very smoky fire. Some of the best moments of the expedition are recalled in the articles that follow, and a slide and tape recording survive to prove that it all really happened. An expedition has itself to thank for much of its own success. Each member docs sons tasks which he may not at the time enjoy, but which he does because they have to be bone for the well being of the group. The officers contribute more - their skills in sailing, canoeing, medical treatment, music, climbing and special subjects, as well s countless ideas and leadership in activities. However, we must look outwards to thank those people who enabled the expedition to happen at all. We must acknowledge especially our gratitude to Lord Granville for the use of his land, his Land Rover, and his boat on Loch Obisary, to Ewen Nicholson for his essential assistance with boats for moving the equipment, handling our post, constant helpfulness and most of all for the use of Eaval Cottage, to his friends and relations for their help and hospitality, to Phillip and Michelle Caxon for their interest, patience and hospitality, and to Mr MacKinnon, headmaster of the school at Lochboisdale who made us welcome at the beginning and end of the expedition. Finally, we are grateful to the Board and executive team of the Society, and to our parents who (for various reasons, no doubt') encouraged us to spend three weeks away from them and in the majority of cases provided the wherewithal for the expedition to run. Thank you for North Uist 1976 and for our taste of the island moors. The North Uist campsite at Eaval. Photo by Ben Buxton. "In 76 I got the ferry from Oban to Barra, and the North Uist expedition happened to be on it. I talked to the leader Alan Fowler and a week later on my way through the Uists I walked to the camp and up Eaval with some of them (carrying my rucksack with all my camping gear in it!). I went to Rainigeadal when the SHS were there, and on my way south I decided to do the Small Isles cruise on the ferry, which the Rum expedition happened to be on!" Which is why for 1976 there are several contributions from Ben from different places.